Marrying a jerk can result in a lifetime of regret. Luckily, there are scientifically based tips to help you avoid making the mistake of marrying a jerk. 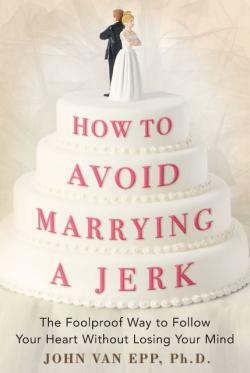 John Van Epp, author of How to Avoid Marrying a Jerk, is a clinical psychologist with an expert's perspective on dating. After helping many patients deal with unhappy relationships, he realized many people didn't understand what to look for in a mate. His book, How to Avoid Marrying a Jerk, based on both scientific research and clinical expertise, outlines a common-sense method for making sure the person you thought was Mr. or Ms. Right doesn't turn out to be Mr. or Ms. All-Wrong. "I first started presenting the program described in How to Avoid Marrying a Jerk ten years ago. I'd been in counseling practice about ten years and had worked with a lot of individuals who were in unhappy relationships - nasty relationships," said Van Epp. "I wondered why people would stay in a relationship where they could see red flags. I started asking, are these people looking at the right things? The problem is most people have a picture in their mind of the kind of the relationship they'd really like. But they don't have a roadmap on how to get there. As soon as they see some of the things they want in a person that seems like a green light." "We all know someone who's come back from the very first date and they just go on and on, and by the third date they're ready to move in together," said Van Epp. "And then by the end of the third month, they're saying things about the relationship that not only disturb them but disturb everyone who cares about them. People say, 'But I loved this person. I kept hoping they were going to change.' And it's about how much they have wrapped their lives around this person. 'Love is blind' happens when people get too involved with someone they don't know enough. Or they get into a sexual relationship with someone they don't know well enough, and that creates a strong bond." "How to Avoid Marrying a Jerk," is based on a model I've developed called the Relationship Attachment Model or RAM," explained Van Epp. 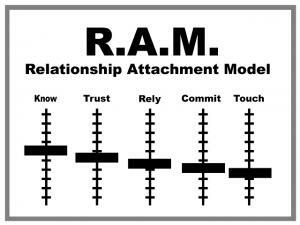 "The RAM has five stages of relationship development. You build a relationship from left to right along this model. It's saying; don't let one of the later stages develop more quickly than the one before." The five stages of the RAM are meant to be sequential and reciprocal. It's often referred to as the "trust before touch" model. Know: Start the relationship by getting to know the other person as well as you can. Trust: Build trust within the relationship and with the other person. Rely: Build reliance with the other person before moving onto commitment. Commit: Have a solid commitment between the two of you before moving onto the final stage of touch. Touch: After all other stages are accomplished successfully, you're ready for intimacy if that's what you both want. The Relationship Attachment Model assigns logic to the process of falling in love. It gives a solid basis of trust and reliance before allowing intimacy to muddle the process of getting to know one another. Van Epp said there are three distinct patterns he discusses within the RAM. "There are three patterns I talk about in the book," he said. "You should look at how a person acts in all their other relationships, including past romantic relationships. How they treat strangers. How they treat their friends. How they act will give you an understanding of what this person will bring to their relationship with you." "Then look at their family. We all take something away from our experiences with family. It's important to figure out what someone has brought from family and will probably be repeating in the family they will create. If they had problems or insecurities, what did they do about them? Did they find a way to overcome them?" Van Epp urges people to then "look at their conscience. Because the bottom line is, who you live with is not just on the surface. You need to know how they see their own world, how narcissistic they are, how mature, how well they empathize. How do they monitor themselves when you're not around to monitor them?" Van Epp cautions against rushing into a relationship. "I recommend at least a three month probation period. Think about it. You have a ninety day probation period on a job. Patterns don't surface until around the third month when enough time has occurred that behaviors not only appear but can be seen as a pattern." "If you get too involved too soon, you're in this highly accelerated relationship and you don't even know what the person will be like when they get ticked off," said Van Epp. "A lot of times people have no problem opening up emotionally to a new partner and spilling everything, telling all. So they feel like they know someone and they haven't even gotten through the ninety day probation period. When this happens, you feel like you can depend on the person. But it's not safe to do that yet. That feeling of trust exceeds what you truly know about the person." 90 days is not a magic number, guaranteeing relationship success, said Van Epp. "If you've been with the person ninety days and all you've seen is good, you can feel excited that you've gotten through three months and not seen anything bad. But you still need to hang on and see what they're really like. Be patient with how the relationship is going. Don't think it's a bad thing to keep your trust guarded. If you see signals of something bad, you don't need to jump ship immediately. But realize that you may have seen only the tip of the iceberg." "People who say 'I knew I was going to marry this person right away' probably felt that way about several people before! It's just that it worked this time," said Van Epp. "A swept-off-your feet relationship is a wonderful way to begin, but the best foundation for a great marriage is a strong friendship. We tend to be more selective with our friends than with our romantic relationships. Don't build your relationships any differently than you would your friendships." "Research shows us that past relationships do affect future ones," explained Van Epp. "Each time we invest in a person in a highly accelerated way, and it doesn't work out, it tends to affect us even once we're out of that relationship and into a new one. The person that you do eventually marry deserves something better than a bunch of baggage from these accelerated relationships." How do you know if a person is a jerk? "I always start presentations by asking people to think of someone they've known who's a real jerk," said Van Epp. "The answers are always different: selfish, self-centered, doesn't handle emotions well, it goes on and on. A jerk is somebody who has a significant or serious problem area with their personality and has no intention of altering it. A jerk is the person who, deep down inside, is not willing to change something that hurts the person they're in a relationship with. You don't have to flee at the first sign of jerk behavior, said Van Epp. "If you see signals of something bad, you don't need to jump ship immediately. But realize that you may have seen only the tip of the iceberg. Watch for patterns and know that whatever bothers you when you're dating will most likely be magnified in marriage."